Having said that, have a look here how to make a really cute homemade baby gift and EYE-CATCHER! In case the shower has a theme, your diaper cake should match the theme. The internet will provide you with plenty of inspiration - just google the theme for images and you'll find a vast variety of ideas and tutorials. If there's no special theme choose one of my ideas instead! A diaper cake is really easy to make, even though there are easier and more difficult designs. But with a little bit of time and patience everybody will be able to create a really cute diaper gift and centerpiece for the shower. 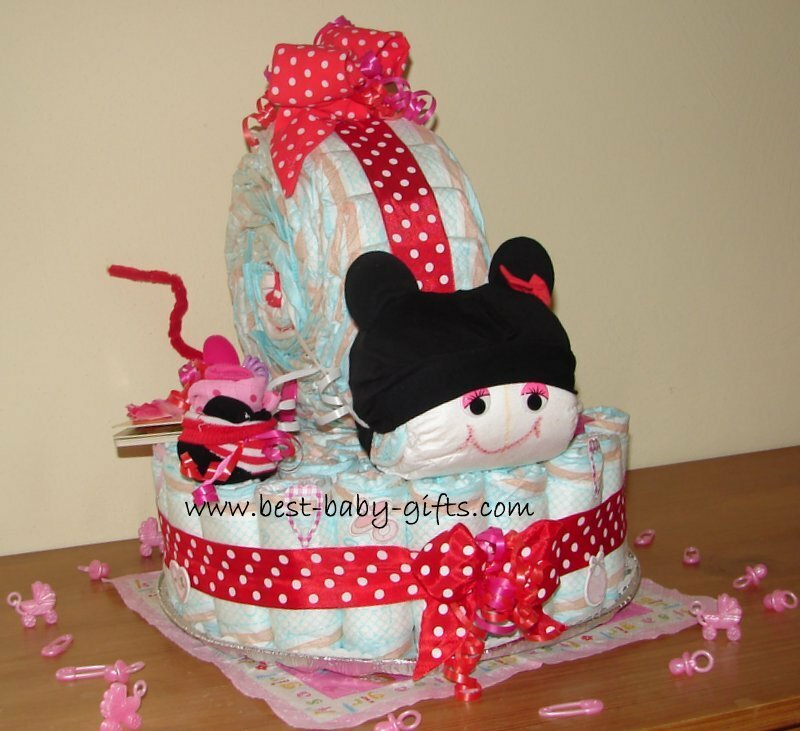 I have two different designs which both work for a girl and boy or even neutral, just select the colors as needed: a Mouse Pampers Cake and a Hot Air Balloon Diaper Cake (see further below). isn't this super cute for a girl? For the diaper cake base you will need approx. 40 diapers, for the diaper cake base tutorial please go here: easy diaper cake. For the diaper mouse you'll need approx. 25 - 30 diapers. The mouse is made just like a diaper snail. If you have a onesie to include, do not forget to roll it into the mouse's body. You'll find the diaper snail instructions here. To transform the 'snail' into your mouse just add the tail. Take the pipe cleaner and pull it half way through the ribbon at the mouse's back. Then twirl both ends together. You can form it to stick into the air or just leave it straight. If you make this for a girl, use your pair of leggings to form a bow and fix it on top of the mouse's body. Otherwise take your polka dot ribbon to make a bow with it on top of the mouse's body. To fix the snail on the base, take the 3 spoons and just push them down the base with the spoon-handle going first. It's best to place one between the head and body of the mouse. Two more right on both sides of the body (as shown here) so the body is sort of 'squeezed' in. This will be enough to have the mouse stay on the base. Here you can also see the onesie that has been rolled into the mouse's body. For your sock roses you'll need one sock for one rose and if it should be a bit more fluffy you can optionally roll a little baby wash cloth in it as well. See how to make beautiful sock roses here in this short video tutorial. Decorate your rose with curly ribbons. Fix your sock rose by sticking a plastic baby spoon down your base, with the spoon handle first. Then just put your sock rose over it. 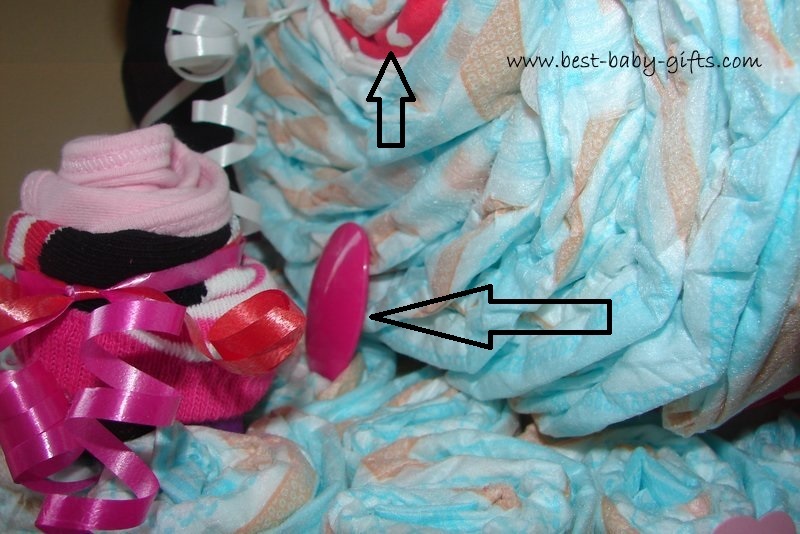 Tip: if you do not want to make sock roses just use the spoons and some curly ribbon to make your diaper cake more lively and colorful. Decorating ideas and tips on fixing small baby items to your cake. More girl diaper cake ideas. 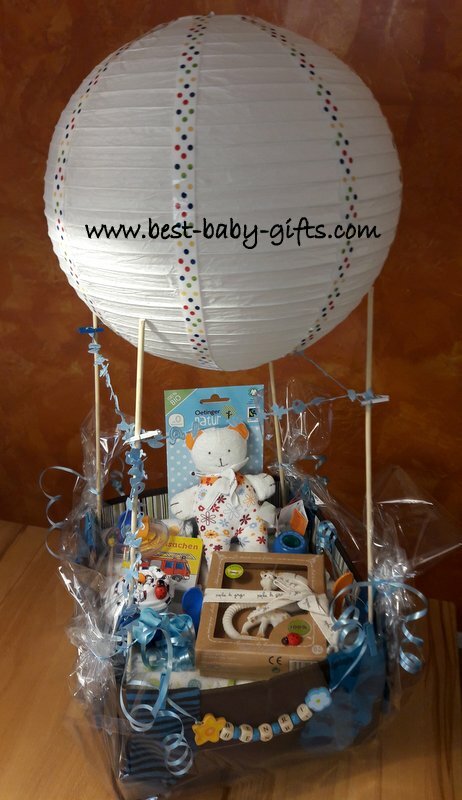 hot air balloon diaper cake with tutorial. More baby shower diaper cake ideas with tutorials. 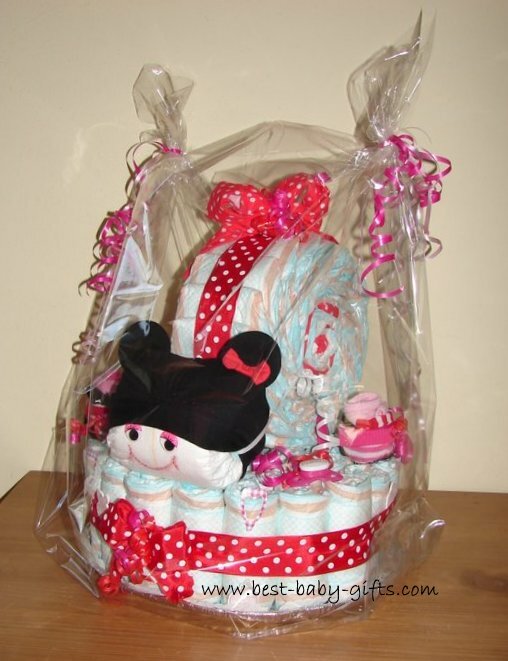 If this is your first diaper cake you might prefer to make the cake with a kit. Have a look at this beautiful baby feet diaper kit here which is great for girls and boys. Be aware that you'll also need diapers and a few more accessories as well as some large rubber bands to make this cake! If you do not have the time - or the nerve ;-) - to make the pampers cake yourself: check out etsy.com for beautiful homemade shower diaper cakes. More tips: where to best buy a diaper gift online.